Do you ever just dream of this perfect cup of hot chocolate? Well, if you’re like me and share a healthy obsession for chocolate and bread, please read on because boy, have I got a tip for you. 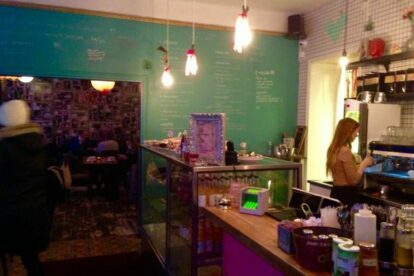 Vurma has three coffee shops around Stockholm; in Vasastan, Östermalm and in Hornstull. This is good news for you, since no matter where in the centre of Stockholm you’re strolling, you’ll most likely be close to a Vurma for breakfast, lunch or even dinner. At Vurma they serve grilled sandwiches, salads, sweets and a wide array of hot and cold beverages. If you head on over to the Östermalm Vurma (Birger Jarlsgatan 36), they also offer a tasty dinner menu. I’m a big fan of Vurma’s sandwiches, which are served both grilled and cold. My favorite is “Främlingen” (The Stranger) a grilled hunk of bread with chicken, avocado, dijon mustard, oregano and tomato. It will most definitely satisfy your bread cravings. Top that off with a hearty cup of Vurma’s homemade hot chocolate and you’re most definitely good to go. When you step into Vurma, it’s best described as a room filled with flea market mish-mash, with a touch of old library. The ambiance is welcoming and the odd tables are coupled with colorful window-sofas and cushioned chairs. So, if you find yourself with the same urge of a good cup-a-choco and a snack, I suggest you direct your feet towards the closest Vurma café.